Plenti+ Nursing Pillow + Toy Bar - Fairytale Story is rated 5.0 out of 5 by 8. Ingenuity’s Plenti+™ Nursing Pillow + Toy Bar helps you cuddle and cradle your baby while offering support during feedings. The Relax-Fit design aligns with most body shapes to offer support for both mom and baby. Crafted with the help of an IBCLC, an International Board-Certified Lactation Consultant this pillow was created to make nursing and bottle feeding comfortable. Its simple design acts as a positioner that helps keep baby in place. When things are hazy during those late-night snuggles or early-morning fusses, the visual tabs of our Breastside Reminder™ System promote the healthiest feeding opportunities by reminding you which breast you fed from last. The pillow material is water-resistant to keep all accidents from leaking into places they don’t belong. The removable toy bar can be positioned overhead to entertain baby while lounging or can be used in front of baby during tummy time. As your little one grows, the pillow can be also used for lounging, tummy time and sitting support. Nursing pillow – Clean before use with a damp cloth and mild soap. Air dry. Do not immerse in waterSlip cover – Machine wash with cold water, gentle cycle. No bleach. Air Dry.Toy bar and toys – Wipe clean with a damp cloth and mild soap. Air dry. Do not immerse in water. 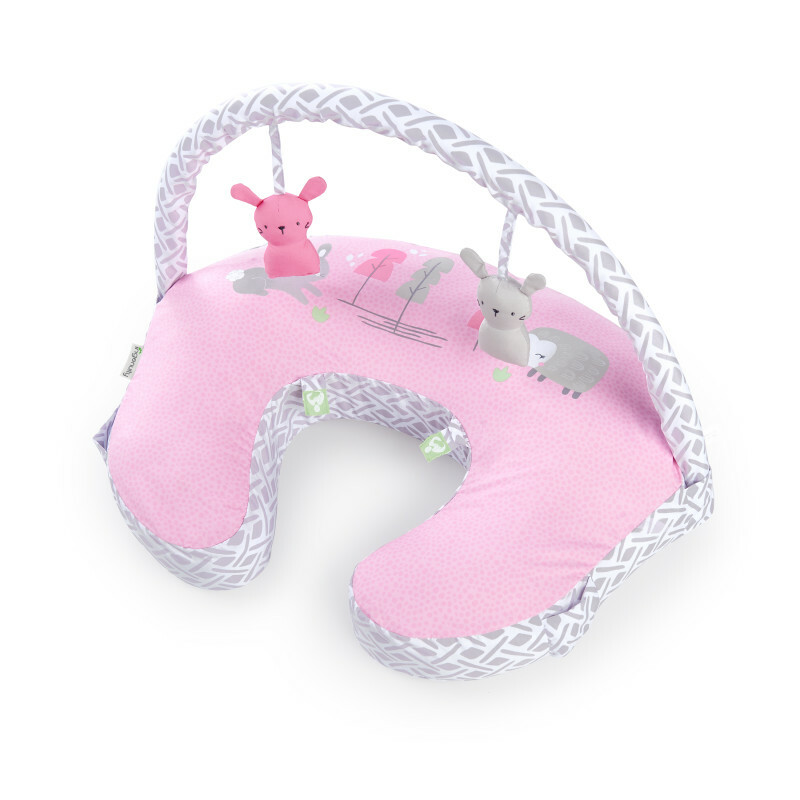 Rated 5 out of 5 by TiffanyDupard83 from Plenti+™ Nursing Pillow + Toy Bar My baby girl absolutely love this nursing pillow. It’s easy for my to nurse her and let her lounge around. I love the play bar feature for when she’s ready to start reaching and playing. Rated 5 out of 5 by KA AL from LOVE THIS!!! 4 month old baby uses it all the time I got this about a month ago and we have used it almost daily! I am mostly using it for the baby to hang out in. She just turned 5 months old and is at the stage where she can't sit upright by herself without support but this pillow is enough to get her working on it, she loves it, she plays with the hanging toys up on top all the time. it is very comfy and on top of that, it's also very cute! we love it. Thank you! Rated 5 out of 5 by Mommabear2727 from So Cute! Love the gray and pink colors. Pillow is good thickness and the washable cover feature is great. Baby loves the toy bar. Makes tummy-time fun! Rated 5 out of 5 by Smader1 from Great versatile pillow This nursing pillow is a great addition to our family. The pillow has a lot of support so it is easy to use for tummy time without squishing down too much. The removable cover is nice for spit up and regular washing. The added feature of the play bar is really nice to have instead of multiple baby equipment products. This does both and keeps the baby entertained while resting on the pillow. The bar slides right into the sides and does not have Velcro but secured tightly. This makes it convienent somitnis easy to grab and slide out or insert quickly. This pillow is really advanced compared to others I have seen and used in the past. I would recommend this for any parent whether a first time mom or experienced. Rated 5 out of 5 by TheasMom from Time to Play Toy Bar is a Hit My little girl is so enchanted with this pillow and toy bar. At first she liked to just lounge and relax on the pillow, but she has discover the toy bar and just loves to talk to her new friends. She just lays there and babbles away at the hang toys. The pillow is so cozy, I find myself grabbing it to for extra cushioning and support. Rated 5 out of 5 by Nustacy1 from Adorable The characters on the pillow are adorable. Great material and the activity bar is well make. Rated 5 out of 5 by kgomez from Firm and thick Omg this pillow is perfect for my baby girl. She is a big girl and likes to sit but needs support. Other boppy pillows are too thin or flat but this one is absolutely perfect and not to mention adorable! The little toy bar is fun too. Rated 5 out of 5 by nrcooley from Versatile Soft Nursing Pillow I love this nursing pillow! It is so soft which makes it very comfortable to use as well as soft for baby to prop against. Baby girl loves the toy bar which can be adjusted to in front of her or over the top of her when propped up. You can also hang additional toys from the removeable bar for added stimulation. The pillow also comes with tabs to help you remember which side you nursed from last (very helpful in the first few sleep deprived months)!